The power to turn information into action. Each and every day, your business generates data. Some of it trivial, some of it helpful and some of it downright invaluable. But traditional business processes aren’t set up to harness the information that today’s companies want and need. Esker’s visibility software is uniquely designed to tap into the ocean of knowledge behind your company’s people, processes and technology. 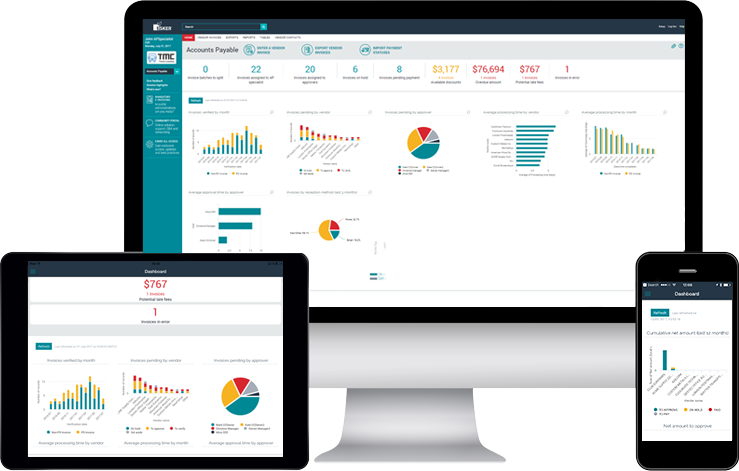 Customisable dashboards featuring live visual analytics allow users to work smarter, dig deeper and take advantage of every available opportunity. daily tasks & urgent documents. problems or opportunities as they arise. metrics based on user preferences. Bring actionable insight to your daily activities. Staff members and management alike perform best when they're in the know. Esker's easy-to-use interface gives them readily available information, right when they need it most, even on the go. Know where you stand on a day-to-day basis. See how many orders and invoices have been completed, how many orders still need to be approved, and how many invoices still need to be validated and paid. Manage workforce based on daily workload. Numbers don't lie. Esker's dashboards allow managers to increase resources as workload increases before their team gets overwhelmed and performance suffers. Ensure no document slips through the cracks. See that invoices arrive at their destination by fixing incorrect email/postal addresses. Also, never miss an order again thanks to automatic priority order metrics. Track down any document at any time. Utilising analytics is more than just seeing data displayed on a fancy dashboard. It also empowers users with the ability to track documents in real-time or instantly locate documents that were archived years ago. With Esker's financial control software, you'll never have to worry about being caught off guard again. Customer invoice trackingWith 24/7 real-time tracking and reporting, every sent invoice fully traceable and stored in an online archive for up to 11 years. 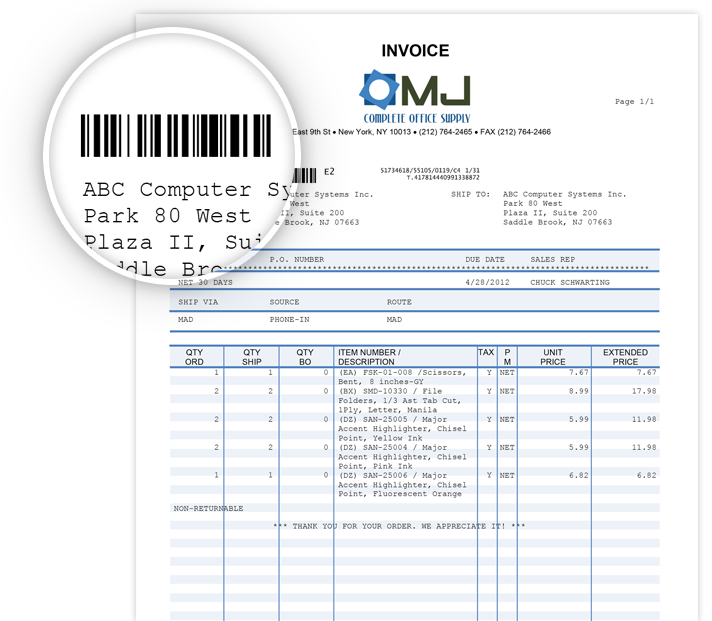 Invoices are tracked through bar codes added to each page for paper invoices and read-receipt for e-invoices. Supplier invoice trackingBecause all invoices are visible as soon as they arrive and easily tracked from receipt to posting to payment, users are able to respond immediately to payment status calls from vendors — boosting vendor satisfaction in a big way. Be the visionary your team needs. Identify problem areas in your processes. Base your decisions on data versus speculation. Esker gets you answers to everything from “Why does it take so long to process an order?” to “How many invoices are pending and how much cash do they account for?”. Need an additional full-time CSR? Is another AP staff member necessary? Esker gives you instant insight into team capacity to better manage resources. Get a clear, accurate overview of performance. Benefit from reporting that analyses critical activities and trends (e.g., current business progress, trajectory of sales and expenses, e-invoice adoption rates, etc.). Persuade stakeholders with compelling data. Esker's visibility software helps you present real results to your team and, if necessary, push for improvements. Users simply need to define when, at what frequency, and to whom a report should be automatically mailed. Pinpoint the source of potential compliance issues. Who did what, when and where? If you don’t know, Esker surely will. Our software keeps a complete audit trail of every manual touch point in your document processes, with the ability to monitor whether or not the proper checks and validations took place. Should questions about a document change arise, a record of all users’ invoice data changes is kept — no modifications can be made without leaving a trace. Feel like you're in the dark on analytics that could help your business? Let Esker show you the light — contact us any time of day.